Bring Back The Latin Mass! Throughout much of the English-speaking world, the Roman Catholic Church is preparing its priests and parishes for the most significant changes to the Mass in the more than 40 years since the church permitted English in place of the Latin. The changes are included in a new English-language translation of the Roman Missal, a translation produced after almost 30 years of labor, intrigue and infighting. 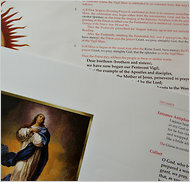 The new missal, the book of texts and prayers used in the Mass, is intended to be closer to the liturgical Latin that was used for centuries than the current version. But after getting a glimpse of the texts in recent months, thousands of priests in the United States, Ireland and Australia have publicly objected that the translation is awkward, archaic and inaccessible. I say: bring back the Latin! The only way I survived Mass as a child was by: 1) reading the Missal stories of the often grisly deaths suffered by early Christian martyrs; and 2) learning Latin words being mumbled by the priest on the altar. Both exercises were enjoyable and useful.